Some twenty years after inventing the bodyboard, Tom Morey retrospectively decided that his original design was flawed. He decided to reinvent the way bodyboards are ridden by creating ESCA (Experimental Space Craft Association). 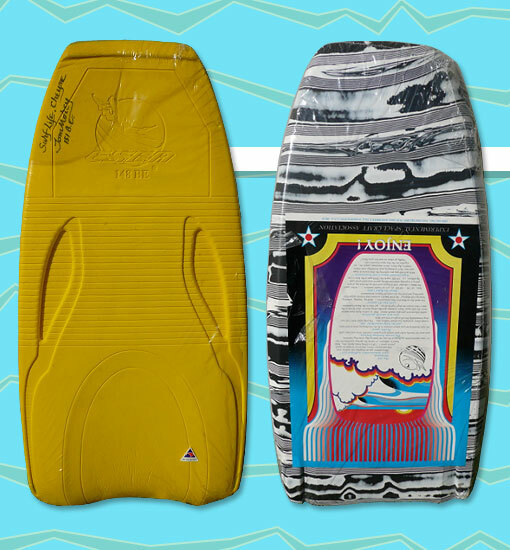 These quirky boards were ridden by putting your elbows in the grooves and flexing the board "with true 3D control" to allow "banking, looping, spinning, hopping, and skipping" along the wave's surface. This particular board is still in shrink wrap and was autographed by Tom Morey himself. Photo: Shane Griffiths.